Necklace/Haar/Aaram/Mala/Malai is integral part of the entire jewellery set worn by the bride on her wedding. Worn by young girls and women of all ages for any festive occasion. Adorned around the neck, it is the most talked about piece of jewellery at a wedding. Depending on the region and the community the bride belongs to, it could be a Gold (South) or Kundan/Polki/Diamond (North) one. There are beautiful imitation ones also being used by several brides. Usually available in Jewellery stores or Fancy Stores. There isn’t any record as to when women began using necklaces. There are of course references in our ancient scriptures. A bride could wear several layers of necklaces on her big day. 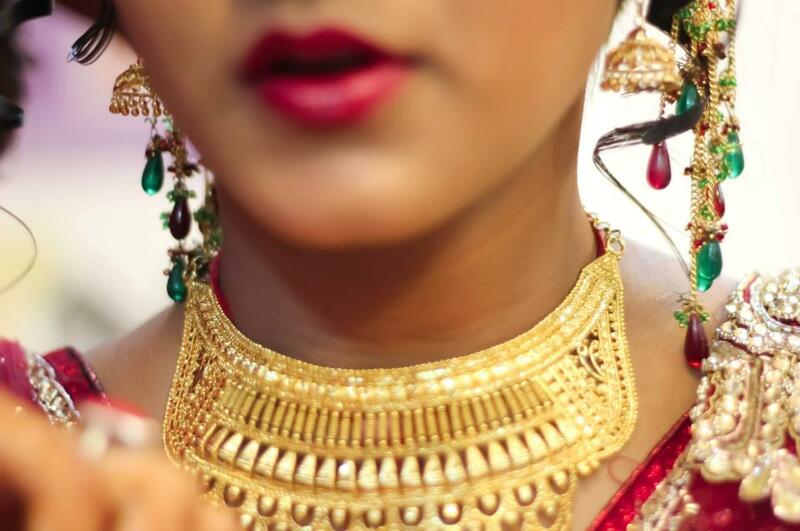 The Mangalsutra or the Thaali although worn around the neck during the wedding does not constitute part of the Solah Shringar. Heavy Kundan ones could be teamed with Western Wear for a Chic Look. Men too indulge in neck pieces to complement their Outfits.